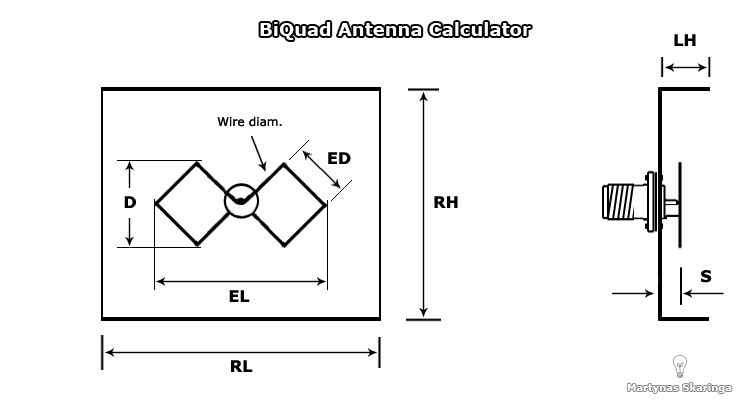 The BiQuad antenna is fairly easy to build and provides reliable gain and it has very forgiving design. You can make quite a big margin of error in the construction and still get 10-11dBi gain. 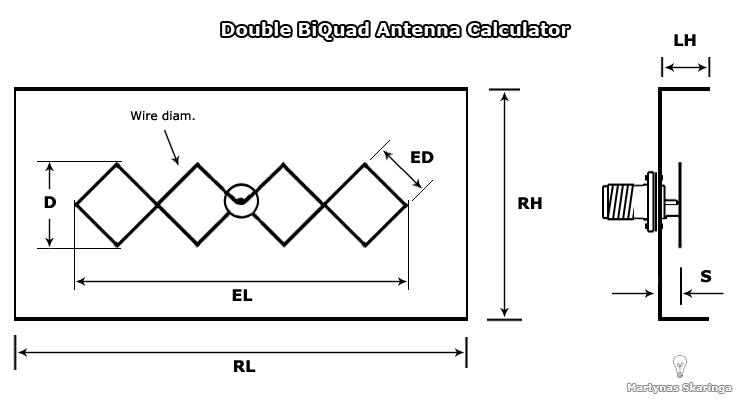 Hence here is the Double BiQuad Antenna and BiQuad Antenna calculators for handmade antenna based on average data. However I highly recommend to follow my instructions, which are based on computer antenna simulation software 4nec2, to maximize performance. Here is listed currently available instructions, simulated with computer software, for handmade 13-14dBi Double BiQuad external antenna. Note: The dBi scale is logarithmic in base 10, where +3 dBi is a doubling in gain! An increase in gain of +1 dBi is equivalent to an increase of 26% and +2 dBi is equivalent to an increase of 60%. This means that the increase in +1dBi is a big deal. Copper wire for the element. Spacers in each end of the element to hold its position and spacing correct height between the radiator and the reflector. Spacers must be from any non-metallic material. Plastic will do alright. Before you start to bend the wire, make it straight as you can. Ensure each side of the element is as straight and symmetrical as possible. The element sides are rectangular and widths are correct, measured from wire center to wire center. The more accurate you do the better as the analysis shows a huge impact in element dimensions. Mine wire bending technique in the crossing sections. Note: You must leave a ~1.5 mm gap between the element wires cross overs and solders. N-connector in the center of reflector. Maintain correct reflector’s dimensions. Maintain correct spacing between the element and the reflector! You must leave approx. 1.5 mm gap between the element wires cross overs and soldered contacts. Use spacers in each end of the element to strengthen its position and spacing proper height between the radiator and the reflector. Spacers must be from any non-metallic material. Finished. Lying on the belly. This antenna should get the best performance at horizontal polarization. 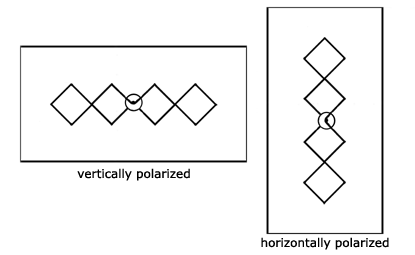 Note: The antenna is horizontally polarized then reflector is held vertically. and I am not so good with math. The outside braid(shield) of the coaxial is there is keep the centre core coppers energy from escaping out and preventing outside noise interference reaching the core. The braid must shield the core till it reaches the actual transmission part of the hardware . I don't understand why you soldered the end of the copper quad to the shield. Both core and shield are shorting at the quad. is it possible to have RH (or any other variables) as a constant figure? my resource is limited to a long and narrow (16.5cm wide) sheet metal. also, i am not able to find calculatior for the version without the lips - is it (lips) a critical part of this antenna measurement? thank you for inspiring me to build my own antenna! Hey Charlie, the only constant figure here is calculated to Frequency. You could use 4nec2 software to make Frequency and RH as constants and look for other variables for best results, but it doesn't worth a fuss. Save your time and do antenna with what ever you got, you will still gain a lot of it even with a huge inaccuracies. as i said before, this antenna type is very forgivable. so no LIPS are not critical part of it. Hope this helps, good luck ! the calculator produce wire diameter 4.99mm that would be quite hard to find. can i use copper tubing instead? or maybe 7strands of wire? You probably doing one for very low freq, not sure if biquad is best option for 500mhz but you can try the thickest wire you got, should work. Hi. I had build 2100mHz and 2600mHz double biquad antenna (without lips) using your guide for 3G & 4G respectively. tested it in countryside, WORKS GREAT!!! I was wondering if you can prepare a calculator for calculating this antenna without lips. I find it easier to build an antenna without the lips. THANKS!! Hey Raymond, i am pretty sure same measurements will work well for both type biquads. Thanks I've built a few of these Bi-Quad antennas now from the calculator on this website. Every single one of them give me good performance! I usually get about 100m range from a WIFI dongle to the router. Hi, I wanna know for the lips effect, its said to avoid rear lobe radiation, and on the figures provided its seem for the HORIZONTAL PLANE (Vertical pol.) position, what if i want to fix the antenna as a HORIZONTAL POLARIZATION (Vertical Plane)? should i bend the RL to make lips? how length? same as LH? and what we do on LH? The two halfs of the antenna are connected in the middle like a "U". Its covered in the shown picture. I´m very much interested in how to calculate such an antenna bcoz that´s an easy way to use it as a feed-point of a satellite dish. I've managed to build a double biquad for 2.4 GHz however I didn't have any 1.3/1.5 wire at home and I've used a 0.85 mm wire. Is it a problem? The power of my alfa network card should be around 0.6 watts. where you get the calculation? what is your refrenction? "the Double BiQuad Antenna and BiQuad Antenna calculators for handmade antenna based on average data ... which are based on computer antenna simulation software 4nec2"
Just go for 1.5 as it is easier to work with then 2mm. What do you think of replacing the copper wire with a PCB board that has the biquad double antenna printed? 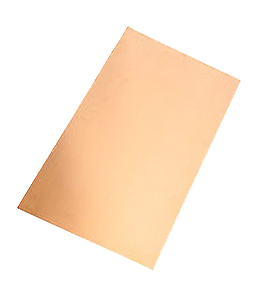 What would be the dimensions of the copper path equivalent to that of the 1.5mm copper wire? Using your calculator and instructions I built a biquad for 1900 mhz broadband internet service through a local carrier. I mounted the biquad on a 24 db parabolic reflector which was designed for 2.4 ghz. I mounted the biquad at the feed point by modifying the original feedpoint hardware. My signal strength went from -75dbm to -57dbm, a very nice gain. Thanks for having this on the web. Nice idea, can you share some pictures from your antenna? 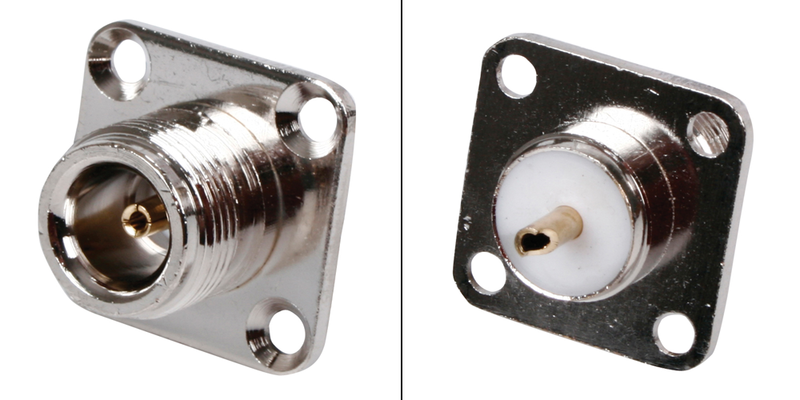 Should reflector be connected to the coaxial cable shield or not? I'm asking because I often see how people who make a biquad antenna do not connect the reflector to the shield of coaxial cable, does it affect on something? how to apply for uhf tv transmitter, work at 855Mhz, which I ask how to get a small VSWR? I would like to build the double Bi quad antenna for 2000 MHz, but i've one trouble. My Huawei B593 is coming with two external antenna connectors. May i prepare two antennas and then install one vertical and the second one Horizontal? Thanks for your comments and greetings from Italy. Sorry the correct frequency is 2600.. If i wanted to build a receiver antenna for an FM radio, 88 MHz to 108 MHz, should I take the difference between the upper and lower frequencies, plug that into the calculator, and use those dimensions for building it? Would this design be appropriate for such an application? hello,can the grounding touch the reflector? Thanks. Should I first bend the wire for crossing section, and then measure the wire for angle, or vice versa? I mean bending the wire for crossing section will make it nearly 1mm longer. All rights reserved. Theme images by Dizzo. Powered by Blogger.